RBS Projects Ltd. assists companies in planning, monitoring and controlling of projects, programs and portfolio management. This service includes development of comprehensive processes, methodologies and information systems for managing their business, in accordance with the leading international standards for project management, such as PMBOK® Guide, PRINCE2® and CMMI®. Implementation of the organization strategic plan, by efficient Portfolio, Programs and projects management. 1 Comprehensive strategic planning process to ensure business value. 2 Defined directions for development and growth, in addition to key performance metrics for success. 2 Enterprise Risks Management (ERM) methodology, processes and tools. 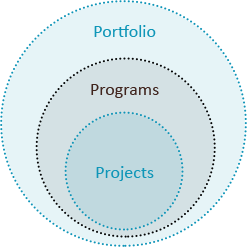 3 Implementation of Project Management Information Systems (PMIS). 4 Managerial Dashboards and KPIs. 5 Planning and prioritizing the corporate resources. 6 Specific processes, such as Strategic Gating, Lessons Learned, Change management, etc. 7 Developing project management manuals (guides).